Ida Andersson (pictured left with Jenny Wegner, left) of Sweden and England’s Paul Moor (right) led the 12th qualifying squad in the 12th Columbia 300 Vienna Open Thursday evening at Plus Bowling in Vienna, Austria, with 1354 and 1333, respectively, to move into the top 8 in the overall standings. The top 8 after Saturday’s Squad 20 will receive a first-round bye for Sunday’s finals. Craig Nidiffer, United States, continued to lead the field of 209 players from 26 countries with 1467 and an average of 244.50. Andersson had games of 256, 236, 181, 192, 210 and 231 for 1306, an average of 217.67, and added 48 pins women’s handicap to jump into third place with 1354. Andersson, who won the women’s ranking in last week’s German Open, teamed with Jenny Wegner to overtake second place in Doubles with 2653. The Swedish youth national team members, winner of the silver medal in the four-player Team event at the World Youth Championships in Hong Kong in August, only trail to Americans Craig Nidiffer & JR Raymond (left, r-l), who lead the competition with 2769. 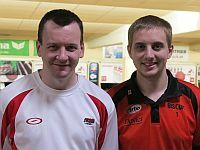 Moor (left with Richard Teece), who won a record 14th European Bowling Tour title in the Chandra Open two weeks ago, finished his series with 257 and 247 to move into sixth place with 1333. 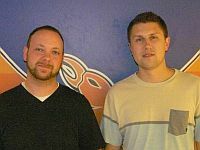 Another two players in Squad 12 surpassed the 1300-mark. Sandra Gongora (right), a member of the Mexican national team which bowls in the Vienna Open to prepare for the XXII Central American and Caribbean Games Nov. 14-30 in Veracruz, Mexico, totaled 1312 including handicap to leap into 12th place. 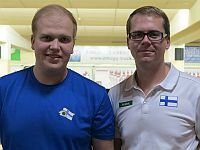 Tony Ranta (left with Jesse Kallio, left) of Finland used a 280 game for 1300, good for 20th place. Wegner missed the 1300 by one pin to sit in 21st place with 1299. Former World champion and now coach of the Swedish youth national team, Robert Andersson (right), slipped to 51st and last place to make the qualifying cut with 1237 and an average of 206.17. Qualifying continues on Friday, October 3, with Squads 13-18 starting at 9 a.m., 1, 5 and 9 p.m. Central European Summer Time (CEST). 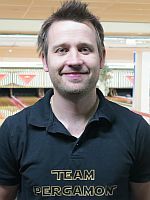 The 12th Columbia 300 Vienna Open is the 16th stop of the 2014 European Bowling Tour and the last of six “gold” tournaments this season, the second-highest of four EBT categories. Players will compete for total prize fund of 73.130 Euro or approx. $ 100,000 – 62.900 € for Singles and 10.230 € for the Doubles event. The singles champion will walk away with the 7.000 € top prize, the runner-up earns 5.000 and the third and fourth-place finishers get 3.500 and 2.500, respectively. The winners of the doubles event will split 1.600 €. The VO14 will be contested on the 38 feet 38 feet lane conditioning pattern with 24.605 mL volume oil total. Download the LaneMap™ Guide to get all information on Plus Bowling. For the 12th consecutive Bowlingdigital will cover the 12th Columbia 300 Vienna Open live from Plus Bowling in Vienna commencing Thursday, Oct. 2 all the way through to the stepladder finals on Sunday afternoon, Oct. 5. Qualifying of the Vienna Open is traditionally contested as a Doubles tournament with separate prize money. Each duo must roll at least one six-game block. Unlimited re-entries – with the same partner or with different partners – are possible, but each player can only cash once with the same partner. Due to a partnership agreement between the organizers of the Columbia 300 Vienna Open, the Track Dream-Bowl Palace Open in Munich, Germany, and the Brunswick Etna Open in Catania, Italy, every squad winner in the Vienna Open (the player with the highest six-game total including handicap) receives a free re-entry into the 2015 Track Open. 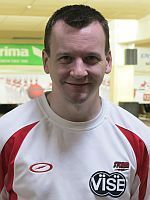 The best Austrian player in qualifying earns a free entry and a free re-entry into the Etna Open 2015, while the second-best Austrian bowlers gets a free re-entry. Qualifying runs from Monday, Sept. 29 through Saturday, Oct. 4 with the final Squad 20 scheduled to start at 8 p.m. local time (CEST). 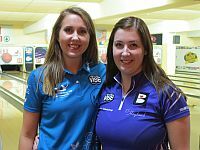 Qualifying concludes with the one-game Desperado Squad slated for 11.30 p.m. Women receive 8 pins handicap each game, an equality handicap provided to women in every event on the European Bowling Tour. and the top 4 players from the Desperado Squad. The top 8 qualifying leaders will receive a first-round bye. The other 56 players will bowl six games starting from scratch. The top 22 will join the top 8 qualifiers in Round Two. Those 30 players will bowl another six games starting from scratch after which the field will be trimmed to the top 18, who will carry the pinfall forward into Round Three. After another six-game block the top 4 players with the highest 12-game total will advance to the stepladder finals. The No. 4 seed meets the No. 3 in the opening match and the winner takes on the No. 2 seed for the right to bowl the top seed for the title, the 7.000 Euro top prize and 150 EBT ranking points. Columbia 300, which sponsors the Vienna Open for the 10th consecutive year, offers the Columbia Perfect Game Award and the Columbia Early Bird Award. 300 U.S. Dollar will be awarded for the first 300 game in the tournament, which will be bowled with a ball manufactured by Columbia 300. The winners of Squad 1-6 (Sept. 29-30), will receive a $ 200 bonus by Columbia 300 if they were wearing a C300 shirt and used a C300 bowling ball. The 2014 European Bowling Tour features 19 tournaments in 13 countries. In its 15th season, the EBT consists of two Platinum, six Gold, three Silver and eight Satellite tournaments. The total prize fund is almost one million Euro. The top 50 men and the top 50 women in each event receive ranking points. Those points will be tabulated throughout the season to determine the top 12 men and top 12 women, who will compete in the eighth EBT Masters July 6, 2015 at Bowling Chamartín in Madrid, Spain, immediately following the III Brunswick Madrid Challenge.